Next to a good hat, Montbell's UL Down Inner Vest may well be the champion of warmth versus weight. This supernaturally-light (4.6 ounce) vest not only qualifies as ultralight—it practically vanishes when not in use. Effortlessly stuffing into its own pocket, or any other nook or cranny you can think of in your backpack. Pull it out when you need extra warmth, and you get a surprisingly effective insulation layer. I was concerned, given how low the weight is, that this wouldn't offer much insulating value. But after spending a week with Montbell's UL Vest deep in the Sierra (including nights that dipped just below freezing), I realized Montbell really seems to have hit the sweet spot of nylon versus feathers. For the weight, this is a simply stunning piece of gear. 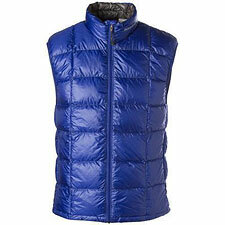 Because it's down it's breathable, so the Down Inner Vest works as a highly versatile part of your clothing system. Put it on at night, and the Montbell vest adds a hefty measure of warmth to your sleeping bag's rating. Comfort is king here: the fabric is soft against your skin, and the cut of the vest makes for a sleek but unconstrained fit. DWR treatment allows the Down Inner Vest to shed a modest amount of moisture, but like any down garment, take care in wet climates or foul weather, as down loses its insulating value when it gets soaked. With an effective weight comparable (if not less) than most T-shirts, Montbell's Down UL Vest serves a wide range of uses. Carry it as cold-weather insurance with your shell, and you're prepared for a huge range of temperatures. Put it on at camp when the sun dips below the horizon, and you've got the warmth of a fleece jacket without the weight or the bulk. Carry the Down Ultralight Vest with you on your summit bid, and you've got a great hit of warmth for cold belays, hanging out on a windy summit (the vest offers a fine measure of windproofing), or trudging back down the hill. Heck, put it on in the winter when you're typing away at your desk sipping tea! Note that Montbell calls this a down inner vest for a reason: the vest's outer fabric is very thin and not reinforced, so things like branches, rock flakes, or pack straps can easily damage it if you're not careful. Given how useful this little gem is, I don't consider that much of a liability—especially when you consider the UL Inner Vest's very reasonable price. Highly Recommended.